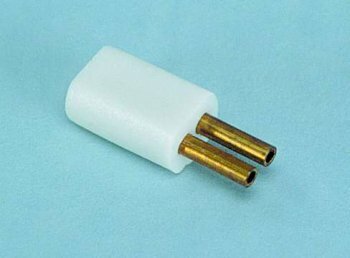 The CK1004-2 is an adaptation of our regular CK1004 Plug. The wires are fed into hollow tubes imbedded in the plug and fastened using a fast drying gel type glue. This is probably the easiest technique yet for connecting lamp wires to a plug. Using the glue gel method results in an extremely aesthetic and long-lasting electrical connection. Mates with CK1003 Outlet. Assembly instructions included. 600 ma rating. Most Cir-Kit table/floor lamps and outside yard lights are now packaged with a Cir-Kit CK1004-2 plug and attachment instructions included at no extra cost. The use of this plug will add a true dimension of scale to any project.